Let’s get one thing straight before we begin. I hate peach cobbler. 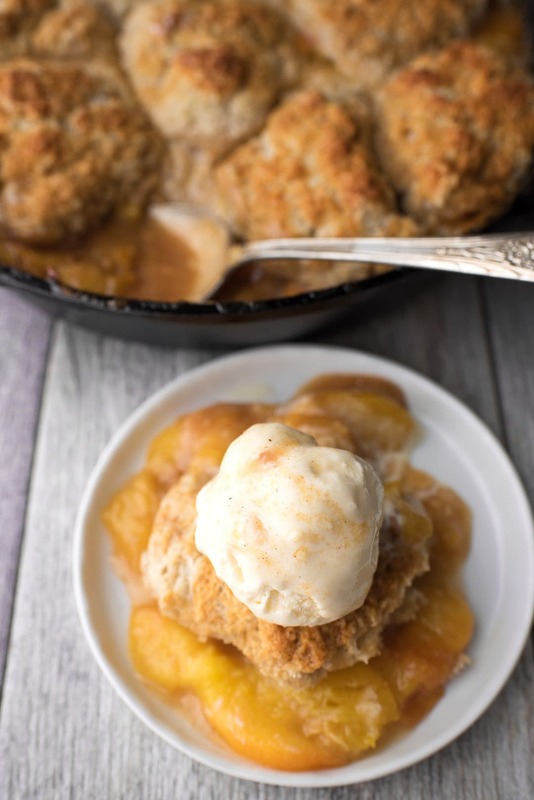 It doesn’t matter that this easy Peach Cobbler recipe is topped with Cinnamon Buttermilk Biscuits that have been brushed with a Vanilla Honey Glaze. I still can’t stop myself from spitting it out. (Not the biscuit part, mind you. Just the cooked peaches.) I recommend making this Strawberry Rhubarb Galette instead. Why Make Peach Cobbler, Then? Good question! I went to the farmers market over the weekend and saw these luscious stone fruits and thought, hey I want to do an Instagram post about the difference between peaches and nectarines. But I also realize that I didn’t have any peach recipes, so I grabbed a bunch. Now, look. I straight up could not remember what Peach Cobbler tasted like. I now know it’s the vilest thing ever, so that was fun to learn, but at the time, I figured I’d like it. * An idea comes to me in the middle of the night and I want to create it. * I want to play around with the chemical aspects of a recipe and test different versions to see what happens. That means, yes, I don’t usually bake things because I’m craving them. If I did, this would be a peanut butter chocolate blog! That doesn’t mean I don’t stand by my recipes. I — with this exception of this easy Peach Cobbler recipe — wouldn’t put something up I didn’t love. That means no more cooked peach recipes, unless I actually like this peach ice cream I’m testing next. Ok, if you want to make homemade peach cobbler, it’s really simple. Basically, you take delicious peaches (and/or nectarines), toss them with some sugar, a little bit of flour, some vanilla, and pour them into a pan so you can turn them into the worst tasting thing in the world. Then, make the biscuit dough. Mix the dry ingredients together and set them aside. Combine the wet ingredients, and pour these into the dry ingredients. Stir until that’s all come together, then use a ice cream scoop if you’re a fussy baker (ahem) or a large spoon if you’re not, and drop 9 spoonfuls on top of the peach mixture. If you want to get really fancy (let’s get fancy), halve a vanilla bean and scrape its seeds into two tablespoons of honey. Mix with a spoon and drizzle it on top of the biscuit dough. Put the pan on top of a cookie sheet and bake at 375°F for 35 minutes or until the biscuits have browned and the fruit is bubbly. Let it cool fully before eating. Now, here’s the thing. Some people make peach cobbler with cake mix. I don’t advise this. Here’s why: the only part of this Peach Cobbler recipe I like are the Cinnamon Buttermilk Biscuits. By using cake mix instead, bye bye delicious biscuits. They’re easy. You can do it without the box. Peach Cobble Recipe note: I shared this with a handful of trusted taste testers who say it’s good. If you think it’s terrible (and you like peach cobbler), don’t low-rate it. Just tell me how to fix it, because apparently to me, cooked peaches taste like death. Warmed over. With a side of mushy vegetables. 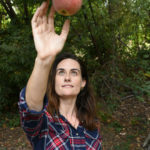 Can I Use Nectarines If I Don’t Have Peaches? Yes. In the centuries-long nectarine vs peach battle, you might be surprised to discover nectarines and peaches are the same fruit. 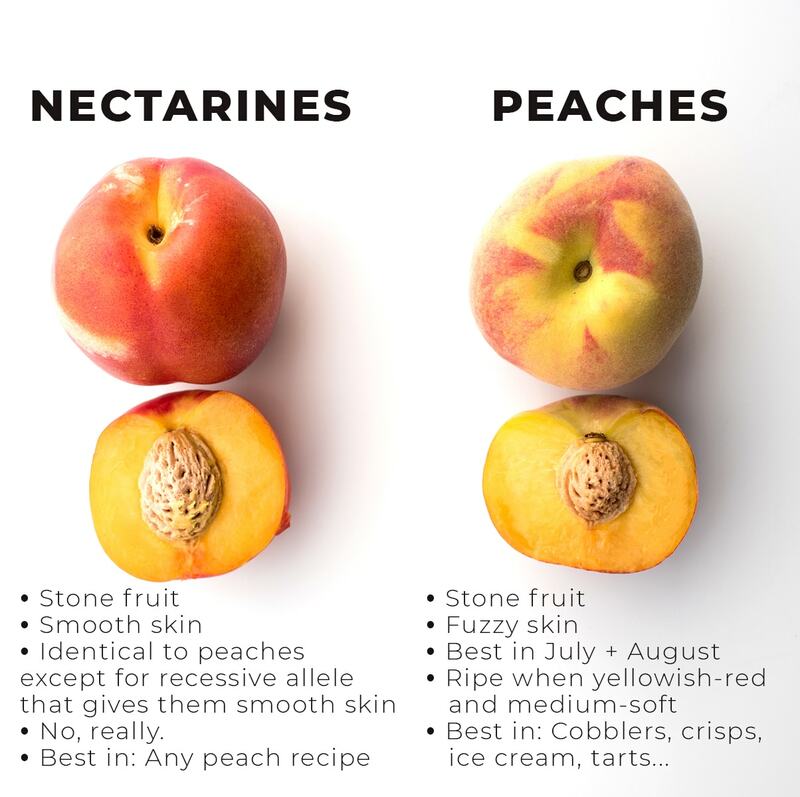 The only difference between a nectarine and a peach is that the nectarine has a double recessive allele (gg vs Gg or GG) that gives it a smooth versus a fuzzy skin. They’re not only in the same family, they’re almost exactly the same fruit. So go right ahead, ruin your nectarines. Place sliced peaches, brown sugar, flour, vanilla extract, and ground cinnamon in medium bowl. Stir to combine and pour into 9x13 baking pan or 10" cast iron skillet. Set aside. Place flour, sugar, baking powder, baking soda, salt, and cinnamon in medium bowl. Stir to combine. Set aside. Cut cubes of cold butter into dough until mixed in and butter is the size of peas. Place heavy cream, buttermilk, and vanilla extract in small bowl. Whisk to combine. Pour heavy cream mixture into flour mixture and stir until combined. Use ice cream scoop or spoon to place 9 drop biscuits on top of peach filling. Scrape vanilla bean seeds into small bowl. Pour honey on top and use spoon to combine. Drizzle on top of buttermilk biscuits. Place pan on baking sheet and bake for 35 minutes or until biscuits are golden brown and fruit is bubbling. Remove from oven and move to cooling rack until cool. I love peaches and your mouthwatering creation really inspired me to make this at home! Thank you so much for a great recipe. Oh, I’m glad! Hope you enjoy the peach cobbler recipe! Now, I’m craving dessert at time of breakfast 🙂 This really looks delicious. Nothing beats hot cobbler with ice cream. Heaven! Thank you! If you try it, let me know what you think! I’ve heard the peach portion is good but I can’t vouch for it myself! 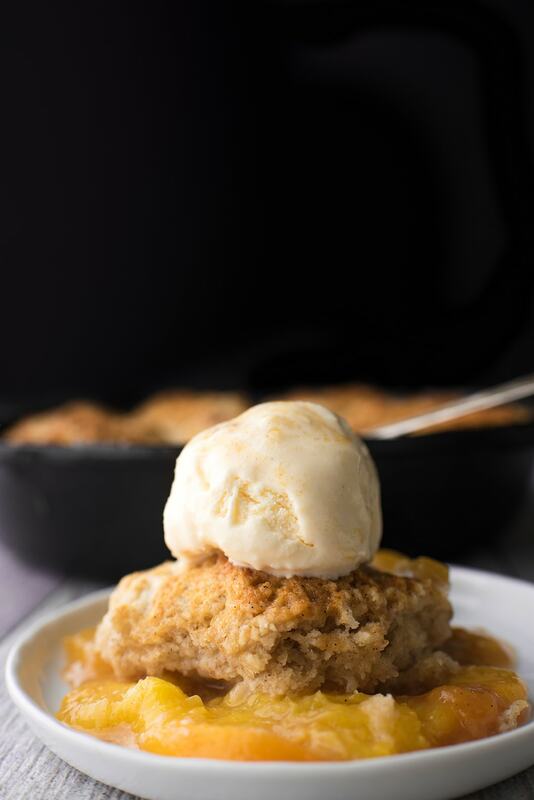 Perfect timing peach season in Florida just ended and I have a ton of peaches that we picked at the farm need to make this cobbler today looks amazing! Thank you! If you do make it and have any suggestions on how the fruit portion can be improved, I am all ears! About peach cobbler, not my fav either, like apple cobbler. If you don’t like peach cobbler, it’s probably the consistency, our family always ate peach cake, which wasn’t really a cake but similar to French desserts with slices of fruit on top but not a tart. They weren’t homemade but came from Fenwicks bakery, a much less sweet yummy dessert. The peach cake sounds better – perhaps I will try that… though after this, I’m a little hesitant about other recipes that call for cooked peaches! These photos are gorgeous! I haven’t had peach cobbler ever but I’m curious to try it! I appreciate your up front honesty!! LOL but the photos are beautiful!! Haha thank you! My friends liked it and I liked the biscuits…I just apparently can’t stand cooked peaches! But everyone asked if I would share the recipe… so I figured I’d post it. I’m open to ideas on how I can make it better (without simply combining raw peaches with biscuits)!